The European Pet Food Federation (FEDIAF) is the credible and responsible voice of the European pet food industry collaborating with authorities, regulators and academics to achieve favourable conditions for the supply of safe, nutritious and palatable products. FEDIAF is fully committed to promoting responsible pet ownership, to the wellbeing of pet animals, to their important social role and to the respect of sustainable development. PFMA is a member of FEDIAF - working alongside other European trade bodies. The Canine and Feline Sector Group (CFSG) is made up of influential organisations, including PFMA, who advise Government on behalf of the sector on strategically important dog and cat health and welfare issues and standards.​CFSG is a "not for profit" body which offers expert advice and recommendations with a unified and respected voice on dogs and cats from members including charities, the veterinary sectors and the pet industry. The All-Party Parliamentary Group for Animal Welfare (APGAW) is an all-party group made up of MPs, Peers and associate animal welfare organisations or groups with a specific interest in this area. The aim of the Group is to promote and further the cause of animal welfare by all means available to the Parliaments at Westminster and in Europe. APGAW seeks to influence the development and introduction of effective wide-ranging legislation to improve welfare and also acts as a discussion forum of politicians and welfare experts to looks at areas of concern. The Animal Welfare Education Alliance (AWEA) is a collaboration of the UK’s leading pet welfare organisations. All 20 members are united by a key belief that young people should be educated about caring for animals and the importance of providing for their Five Welfare Needs, as set out in the Animal Welfare Act 2006: The need for a suitable environment, the need for a suitable diet, the need to be able to exhibit normal behaviour patterns, any need to be housed with, or apart from, other animals plus the need to be protected from pain, suffering, injury, and disease. AWEA works with the Department for Education to encourage reference to this subject. Please scroll down for full list of all the charities we work alongside. www.peteducationresources.co.uk (PER) is a website created by PFMA for AWEA members who all produce a wealth of high quality information on pet health and welfare. This useful signposting website hosts all educational resources, events and visits produced by members of AWEA from curriculum linked lesson plans for teachers to fun resources for after school clubs. 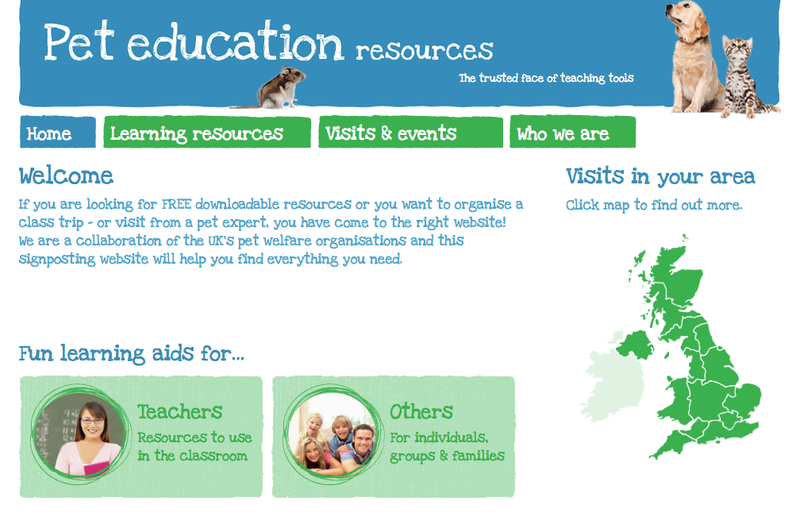 The website is a great example of organisations working together to improve animal welfare education.